Welcome back to Boards and Barley. It’s been 20 days since I last posted anything. Why? Because board gaming stuff is a hobby and not a job (Though if that changed it would be pretty sweet). I love blogging about board game stuff, but when things get really busy this hobby falls to the back seat before anything else. Never-the-less, I’m going to adjust my schedule so that I can continue blogging and sharing tips about homebrewing and designing board games. One of the first things I want to do is to renovate (i.e., create) a Game Design Page that compiles all of my articles about the game design process. I’ve posted stuff about game design from concept to publication and I think having all that in one place would be really useful. I also want to start a regular Tuesday article about beer that focuses on a Beer of the Week. I like to try as many new beers as I can and I’d like to share my thoughts about the beer and its style with you. Another thing that I’ve missed doing are the “Design Me” game design exercises. These are relatively easy to post so I think I’ll try to get back into those. Plus, they are very beneficial for game designers as they help flex your game design muscle. But today is Monday so let’s check out the Boards & Barley I’ve been enjoying! I bought a six pack of this brew at my FLBS (Favorite local beer store) because they were giving away samples and because the proceeds would go to support the local Honor Flight. For those not aware of the Honor Flight program, it is a program that takes war veterans to Washington DC to visit their respective war memorials. Then there are usually nice crowds to welcome the war heroes back home when their airplane lands. With a father who was in the military and with a brother who has served tours of duty in places I would never want to go I am very happy to support the military whenever possible, and the honor flights are a great way to do so. My sister beat me and become the Harbour Master! There is a lot of game in this little box. In Harbour players try to manage their resources, ship goods, and buy buildings. There are a lot of interesting decisions to be made while hoping your opponents don’t modify the market and sweep the rug out from under your feet. I’m glad I backed this Tasty Minstrel Games project on Kickstarter. NEW! Fidelitas – I thought this game was pretty clever. I played a 2 player game and I enjoyed it. Playing it a second time will be even better know that I have a better idea of how the game is played and what combos exist. So those are the Boards & Barley that I’ve been enjoying. What have you been enjoying? It’s been two weeks since I posted anything. Yikes. Life is busy when you have three kids. But no excuses. I have four articles in draft form that i just need to polish off. Hopefully that will happen soon. That dude is freaky, but the brew is good! My friend Mark from Chicagoland brought this over when they visited a couple weekends ago. I have been trying to become more of an IPA drinker to mild success. This IPA, however, has a very nice and subtle sweetness to it that makes it more enjoyable for me. Thanks, Mark, for bringing it over! Better than Race for the Galaxy, imho. I picked this up at my FLGS (Favorite Local Game Store) when I was demoing Scoville. I’ve always like Race for the Galaxy but I’m not sure I’ve ever totally understood it. There are so many icons and it’s not totally straight forward to me. Roll for the Galaxy is much more streamlined and understandable. I love how they incorporated the dice for choosing and completing actions. The dichotomy of developments versus worlds is much more clear than in Race. Overall I thought this was great and I imagine it will be hitting the table quite a bit! NEW! Terra Mystica – Whoa… there’s A LOT of game here. This is a very good and enjoyable Euro game where you can’t ever do as much as you want but you can still feel good about what you can accomplish. It takes a long time to play but I enjoyed it enough to want to play again. NEW! Cinque Terre – I got this in a local Math Trade and played a 2p game. It’s pretty fun, very colorful, and I’d like to play with more than 2. NEW! Among the Stars – This is much better than I expected. This was also a 2p play so I’d like to try it with more, but I really enjoyed it. Plus, there are already a bunch of expansions so it’s got a lot of replayability. Welcome back from a busy Valentine’s day weekend. I hope you all treated each other with love! My wife was out of town most of the day Saturday so I took part in a local Math Trade (where I received a Dixit expansion, Splendor, and Cinque Terre). Then we grabbed a pie from a local diner as a gift for my wife. Then some friends came over and we played Deus, which is inspiring me to build a deck-based engine builder game utilizing similar but unique mechanics. Then yesterday I had the privilege of demoing Scoville at a local game store. A 13 year old loved Scoville and his grandpa ended up buying it for him. I hope it inspires him to become a gamer! Dubbel-y delicious… compared to my previous homebrews, at least. Despite having several new beers this past week I had to make my homebrew the spotlight this week. It is by far my best homebrew yet and finally one that I’m not at least mildly gun-shy about offering to people. It is really excellent. My colleague requested the recipe after I gave him a six-pack. And my friends actually enjoy it. There is a neat and interesting card mechanic where you utilize the cards in your hand to move your ship across the sea. Using a similar color as your previous card moves you straight across. Using a different colored card moves you diagonal down and across. 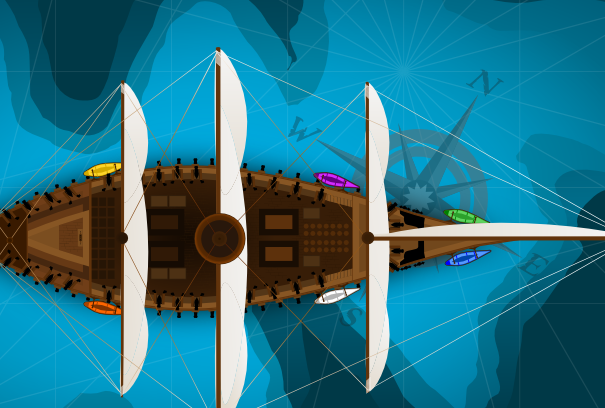 The goal is to earn points, which is done most regularly by completing objectives, which are earned based on how far your expedition traveled across the sea. I thought the artwork was nice and colorful. But the gameplay seemed really dependent on the cards you were able to procure. I found it difficult to put together a nice expedition. But I’d like to play it again to see if it was just a case of bad luck. So what Boards & Barley have you been enjoying? 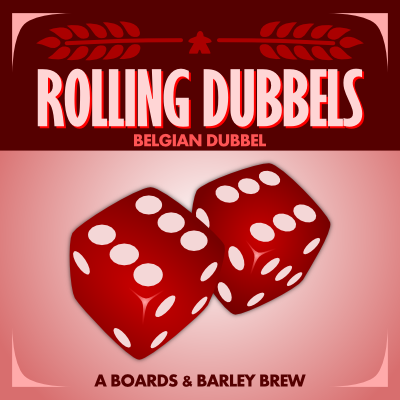 Are there any games or brews you would like me to try? Just let me know! Not terrible at all, until the bottle is empty! I bought one of these for my uncle as a Christmas present so that I could joke with him and say that I bought him some terrible beer. Alas, he didn’t attend our Christmas celebration so I failed to deliver the joke. I did, however, get to try this beer for the first time recently and it is anything but terrible. In fact it is quite tasty, which is usually the case for anything coming from Unibroue! Woo hoo! Four new beers! Not bad at all. Can you catch the mutineer? I do not possess good social gaming skills. That is why I have a strong love/hate relationship with Mutiny.The game is so excellent. The social deduction aspect is hilarious. Make accusations, charge other people as the mutineer, use your special abilities, and watch out for knives flying at your back! Thanks for reading! What Boards & Barley have you been enjoying? A new year is upon us. It was 8 degrees below zero (F) this morning and will snow 2-4 inches tonight. Oh joy. But Boards & Barley is back! So there’s that. If you are new to Boards & Barley or made a New Year’s resolution to read this site more regularly, then I welcome you with open arms. On Mondays I like to recap the beer and board games I’ve played since the last Monday Brews article. It’s been a couple weeks and we had gaming friends over for a few days so the Boards and Barley are both longer lists than normal. But before we get into that I wanted to mention that I’ll be posting my 2014 Recap article tomorrow and a Scoville article on Friday. As a reminder, if there are topics you would like me to blog about, please let me know via Twitter or via comments on this article. This brew was a gift from my wife. She found a beer with a 100 rating on Ratebeer and wisely purchased it. Lagunitas’ brews are usually hoppy, as was this brew. But this brew had 63 IBUs, which is about perfect for me. This enjoyable brew had a nice balance between hops and body. I’d drink it again. Capital Schwarz in a Box – Don’t get it. It smelled like wet dog and tasted like Dinty Moore Beef Stew. McEwan’s Scotch Ale – Probably the best Scotch Ale I’ve ever had! Your objective is to settle… Imperially! I love this game. I love the combo-ing or chaining of cards. I love figuring out how best to obtain and spend the resources. I love that it’s easy to teach and play. I love the artwork. I love everything about it with the exception of some downtime. But the downtime can be used to figure out what you are going to do next. The other thing I love about it is that my wife enjoys it. That means it will hit the table more often than some of the “heavier” games I own. If you haven’t already done so, check out Imperial Settlers by Portal Games. Scoville x3 – I love those little peppers! Charades for Kids – My daughter was having an absolute blast with this game. Unpublished Prototype – Ziggurat – This is my design, but it still needs a lot of work. Garden Dice – Love that Joshua Cappel artwork! It was a really clever game. Trajan – Such a great Feld! Sequence for Kids – My daughter won 3 out of 4 games with 3 players. And I don’t let kids win. She earned it! What Boards & Barley have you been enjoying? What were your favorites of 2014? Thanks for reading and I hope to bring you lots of great content in 2015! We believe in creating memorable, beautiful, fun games.